Today's activity was the Assembly -- a huge program primarily featuring the ACT orphans, but also recognizing and thanking the staff, board, volunteers, Michigan team, and a host of dignitaries from the Muko area. The Uganda Martyrs field was set up with two tents: the first, large one was filled with blue plastic chairs for the dignitaries, Michigan team, board members, volunteers, and parents; the smaller one functioned as a staging area for the performances. The children hauled benches -- as often as not, carrying them on their heads -- from the school and set up a second seating area in the full sun for the villagers. Starting promptly at 10:00 (the announcedstart time), Josiah got on the microphone, proclaiming, "You are welcome! Everyone is welcome! You get seated! Get seated!" This announcement, interspersed with specific welcomes to various dignitaries including the Member of Parliament for the area, was repeated over and over until the Assembly began at 10:30. Guma then introduced himself as the Senior Manager, personally named and thanked all of the dignitaries present, and introduced the Mistress of Ceremonies, a 12-year-old orphan named Precious. The Assembly was then officially opened with the children singing the Ugandan national anthem (accompanied by Howard on an accordion) and the Michigan team singing The Star Spangled Banner (no accompaniment). The theme of the Assembly was "ACT, My Family." Precious explained it, saying, "We are orphans -- we lost our parents. But we have been given new parents and a new family, the ACT family. So now we are like normal children." Francis Girukwayo, our first orphan to be attending university (he will graduate nest year with a degree in public administration), gave a history of ACT. Next came praise songs and children's dances, which had clearly been well rehearsed. The audience joined in, clapping and swaying to the beat. When the songs and dances were finished, six different orphans offered prayers -- the Lord's Prayer (which included the request, "Give us this day our daily food"), then prayers for families, churches, schools, hospitals, and nations. Two more orphans came forward to offer Bible readings from Proverbs. In between presentations, Josiah announced the names of visiting dignitaries and welcomed and thanked them as they arrived. After each presentation, Precious exhorted the audience to "Give them a big handclap!" before she introduced the next presentation. A large group of children recited a long poem extolling the virtues of leadership and the opportunity to make a difference in the world even though it means "getting out of my comfort zone." "I have been waiting for things to happen," the poem continued, "now they want me to make things happen.....I think I have heard the challenge of leadership!" The MEP (Muko Empowerment Program) women gave a demonstration of their crafts, including information about the materials they use: raffia and more than one kind of papyrus for the baskets, African fabrics for sewn items, and a variety of papers, including wrapping paper from the US, for the jewelry. They explained that the money they earn improves their general welfare as well as proving funds for school fees, clothes, and other household goods. They ended with inviting other women to join the program. The high school students danced next, featuring Howard, wearing leg rattles. We had watched a group of boys making the instruments on Thursday: they filled small hollow gourds (8 per leg) with seeds, then secured them in two vertical lines to sticks, using long strips cut from an inner tube. Howard used longer inner tube strips to tie a set to each leg. When he danced he stomped his feet, rattling the gourds. The US team was also required to make a presentation. Nancy has provided us with a Bible verse for each day of our trip, so we each read and commented on one. A sub-set of the orchestra -- 3 violins, 2 violas, and the 2 cellos -- played "Amazing Grace." By this time, it was quite hot. Many of the people sitting in the sun had brought large umbrellas and most of the village children had moved to whatever small patches of shade were available. The ACT staff sang a lovely and moving Swahili song, "Mambe Sawasawa," meaning "Things Are Already Better." And then we had the speeches and presentations of certificates for board members and volunteers. Generous and Sue did an admirable job of keeping their part as short as possible. The Member of Parliament, however, gave a political speech that practically didn't need translating -- it was long and full of dramatic gesticulations and, in general, was worthy of any politician anywhere. He did promise full support to ACT, including a donation of computers, a donation of seeds to the HANDS team, access to local officials, and use of government land. With luck, he will follow through on some of this. This two-hour Assembly, beginning at 10:30 am, finished up at 2:45 pm. But it was hailed as a great success by all. An extra level of excitement: we found out that the entire proceedings were broadcast over the radio for the entire district. Returning to the Center, we found four of the so-far-unrecorded eight orphans and were able to interview them before we came back to Kabale to do a little shopping. We wanted to buy another sewing machine, but couldn't find the store. Sue called Guma, who began his directions with, "Do you know the tree with the birds?" We did! It's a big beautiful tree where several herons are nesting, right downtown. So we were able to find the store, but they were out of sewing machines and suggested we place an order on Monday. Francis lead us through the African market -- we had a few items we were looking for. We also visited some small shops downtown, and both Lisa and Nancy bought beautiful dresses of African fabric. At dinner we were treated to a jackfruit the staff had bought for us. None of us had ever tasted jackfruit before, so it was a real adventure. The consensus was it's sort of a mix of pineapple and banana flavors, with maybe some mango added. A great end to a very successful (and exhausting) day! A Post Script FYI: We've been hearing a bit about presidential politics (regarding the Ugandan president). All I can say is they're even scarier than American presidential politics. Below: Children moving benches; presentation by MEP women; Howard and high school students dancing; U.S. 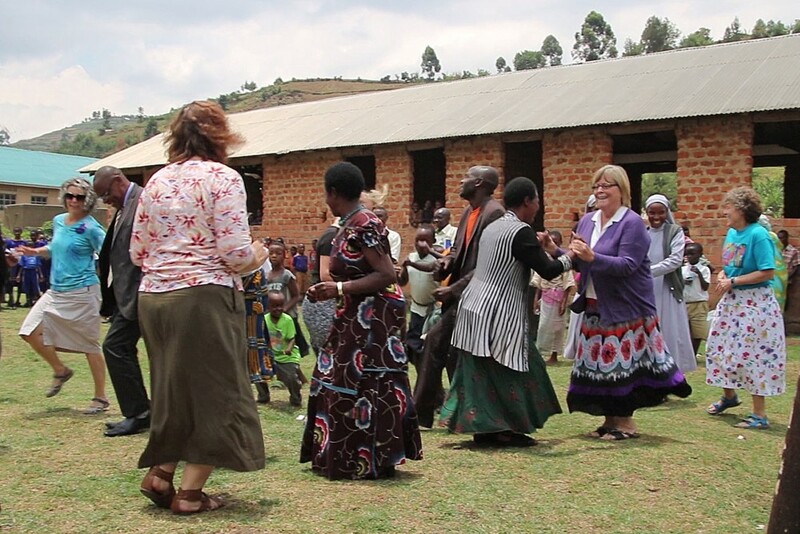 Team presentaton; Uganda staff song; dancing competition, including Ellie, Sheryl, Sue, and Lisa.